Hi guys, I hope you're all having a beautiful day so far! Mine hasn't been so great and I'm actually a bit sad as I'm writing this post... I hurt my right arm yesterday just above the wrist. I normally wouldn't be annoying you with my personal life (sorry!) but unfortunately this will be affecting the blog. Most of my right hand and arm are immobilized right now, I'm not in pain but as much as I've tried to swatch I don't think it's going to happen anytime soon. Luckily my left (swatching) hand is fine and the husband and kids have offered to paint my nails for me so I hope you won't hold it against but they're going to be doing the handiwork for the next couple of weeks. Anyway, today I have a beautiful red polish from Morgan Taylor to show you. I had never tried any of their products before receiving a package from my friend Kat and you know what? I'm seriously impressed! Man of the Moment is a gorgeous cherry red jelly with awesome formula and really nice pigmentation. My kids did the painting for me today while hubby was still at work so please ignore the bald spots and poor clean up, I'm sure their skills will improve in no time! You're looking at 1 coat and no topcoat below, 2 would probably have been better so you'd probably want to keep that in mind. I can't wait to hear your thoughts on Man of the Moment. 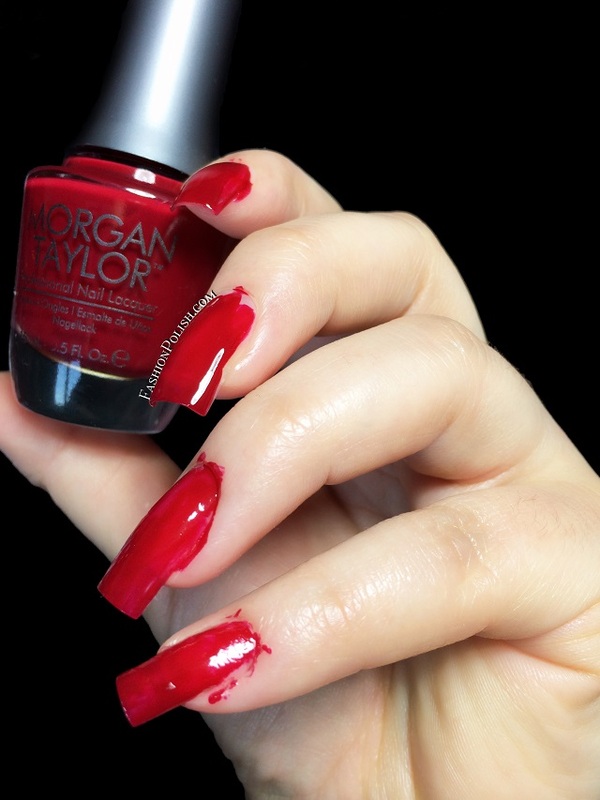 Have you tried Morgan Taylor polishes?